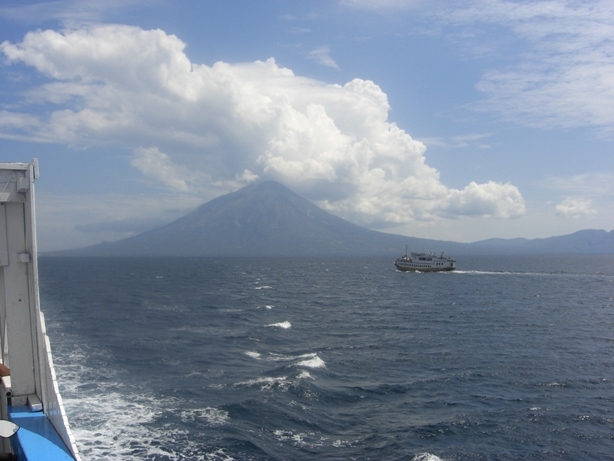 You get your first view of Ili/Ile Boleng as the ferry from Larantuka rounds the southwest tip of Adonara – there it is, a fine 1,661m cone looming over this little-visited island just east of Flores. The peak makes an excellent day hike, and the views from the summit over the surrounding small islands are fantastic. With a variety of routes and a stretch of rolling grassland near the top this would also make a nice overnight trip for those with camping gear. 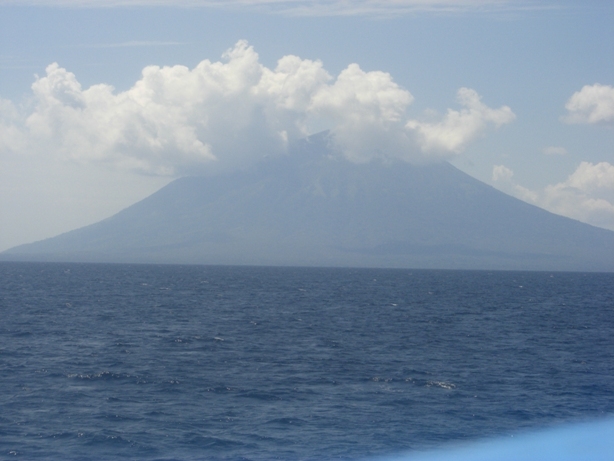 The peak is currently dormant, having last erupted in 1991, and there is no visible sign of activity in the crater. 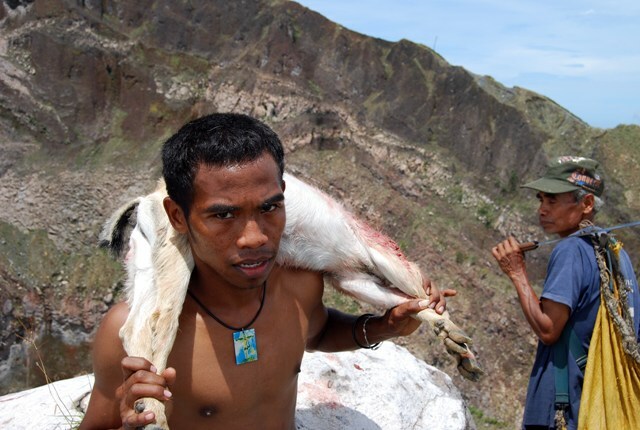 Locals “feed” the mountain at the start of the wet season each year, tossing chickens and other offerings into the crater to ensure that it stays quiet. There are various taboos on the peak. Fish and salt are forbidden on the summit; boats, whales and other maritime topics shouldn’t be discussed, and if you must talk about salt for some reason, don’t say the word – call it “grey stuff”! 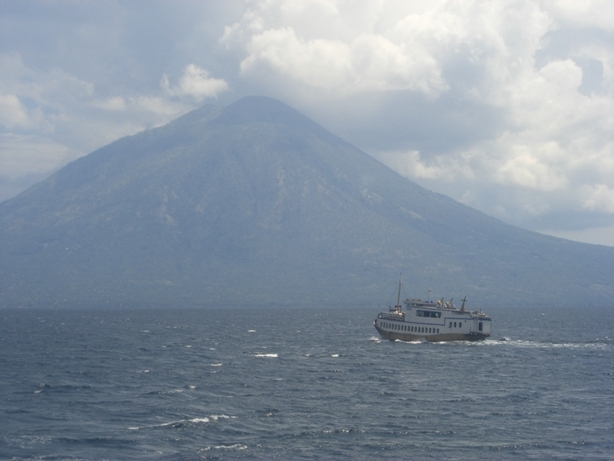 There are apparently various routes to the summit, and locals from different parts of Adonara will claim different approaches as the best and fastest. 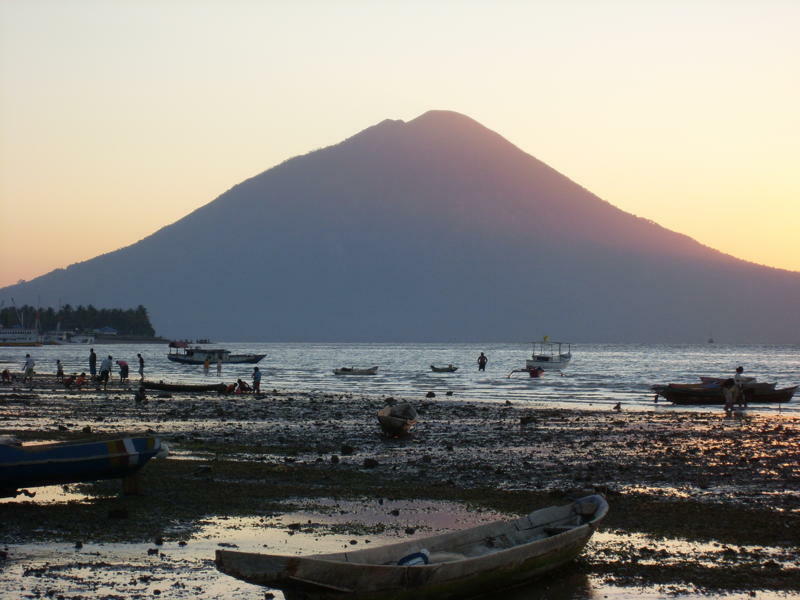 Expect estimated walking times to the peak offered by locals to be wildly inaccurate – although the mountain is such a dominating presence on Adonara surprisingly few people have been to the top. 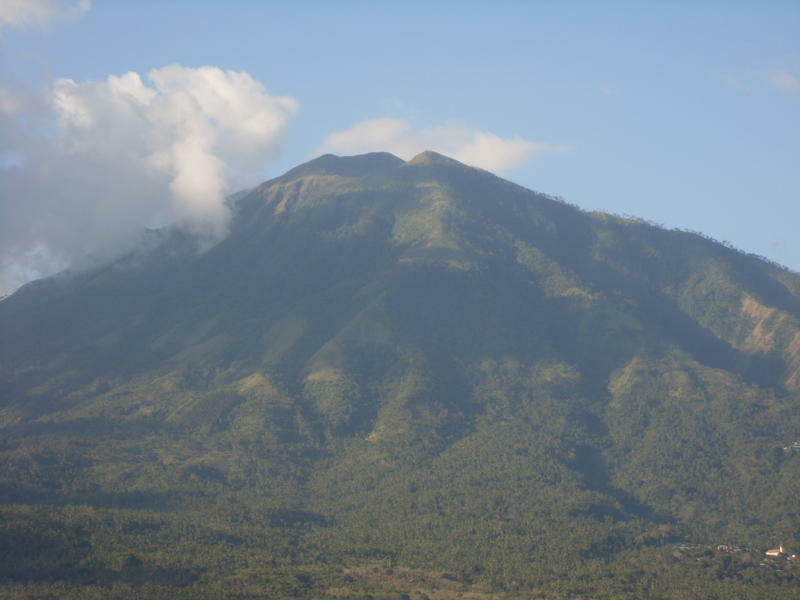 One good route to the peak begins in the village of Lamalota on the western slopes, about 20 minutes by ojek from Waiwerang, the capital of Adonara. You will definitely need someone to lead you through the initial network of paths through the thick forest on the lower slopes, though once clear of the trees you could easily make your way up unguided. Tell people in the village where you want to go and someone will materialise to help you. 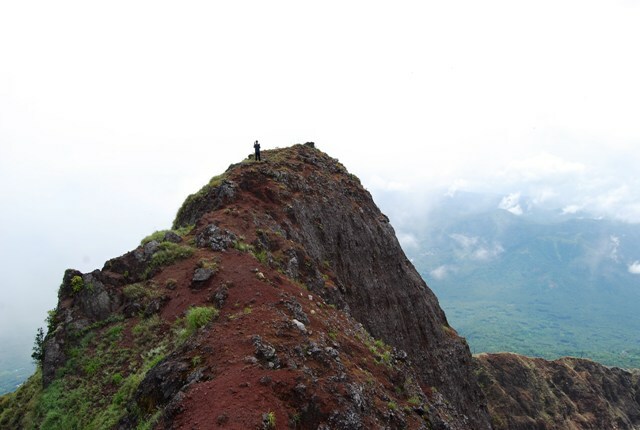 So few outsiders come to climb Ili Boleng that the concept of organised guiding for money doesn’t seem to have occurred to locals, and they may show you the route, even right to the top, without any expectation of payment. 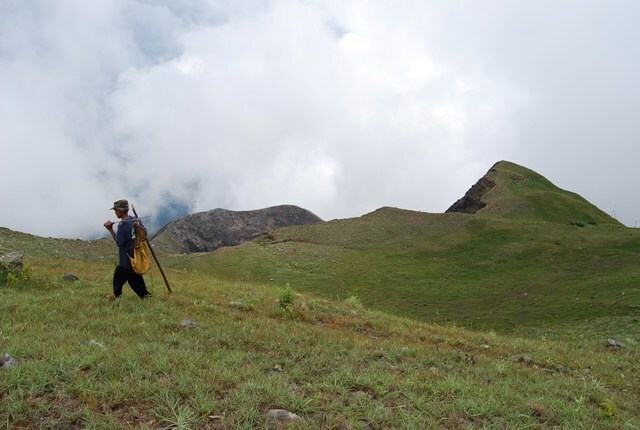 This leaves the hiker in a bit of a quandary – it seems a little unfair to take advantage of local hospitality for a free trekking guide, but it would also be a shame to splash money around indiscriminately, possibly making welcomes less warm and sincere for future visitors. Bear this in mind but do whatever feels right to you! From the end of the sealed road in Lamalota the route at first follows a drivable track heading north along the flank of the mountain for a few hundred metres before branching off to the right along a narrow forest trail that winds back and forth through the trees (this is what you would never find your way through on your own). The path passes through some smallholders’ plots where a little maize is grown. Locals also grow vanilla in the forest, and there are wild guavas, avocados and an abundance of coconuts. 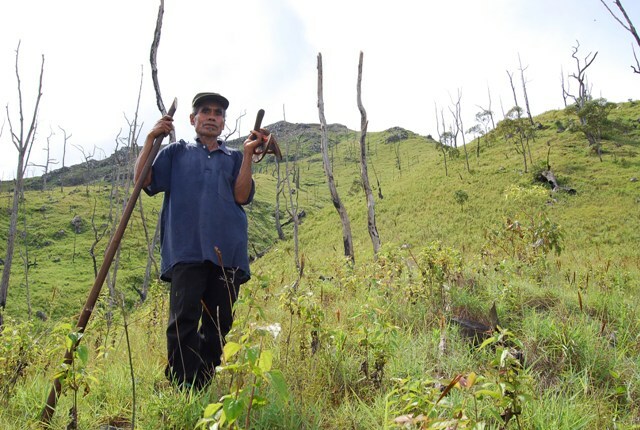 Birdlife here is strangely exotic by Indonesian standards – parrots and parakeets – for Ili Boleng stands on the eastern side of the Wallace Line. After about an hour winding through the trees the path begins to rise steeply, the forest thins, and the way to the top appears. This upper section is cloaked with grass and there is a distinct path. From the edge of the trees a guide would no longer be necessary if you were keen to walk alone. It is between 30 minutes and an hour from here to the lowest point on the crater rim, directly ahead. If for some reason you can’t pick out the path, just keep to the left of the broad, grassy gulley which leads down from the edge of the crater into the forest. 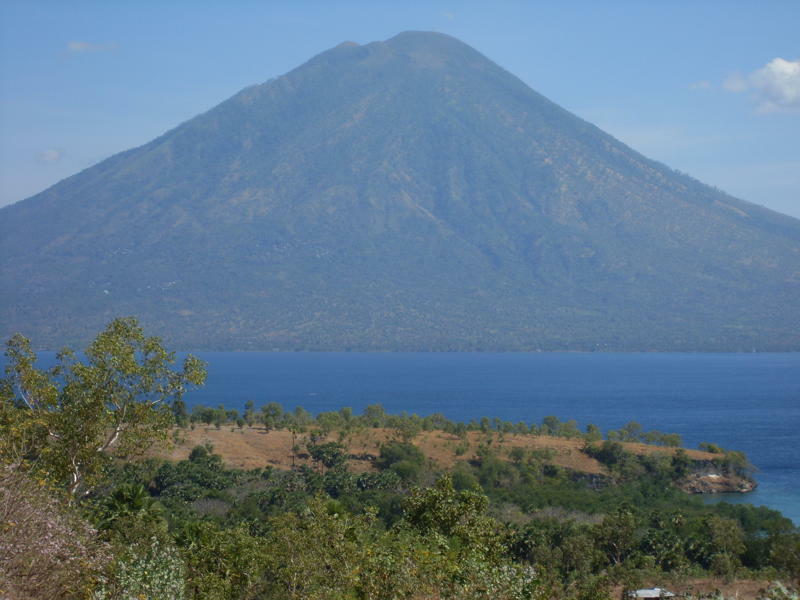 A view down into the crater opens as soon as you reach the rim, while a fine panorama of Adonara’s lower hills, the offshore island of Solor, and the mountains of eastern Flores appears to the west. 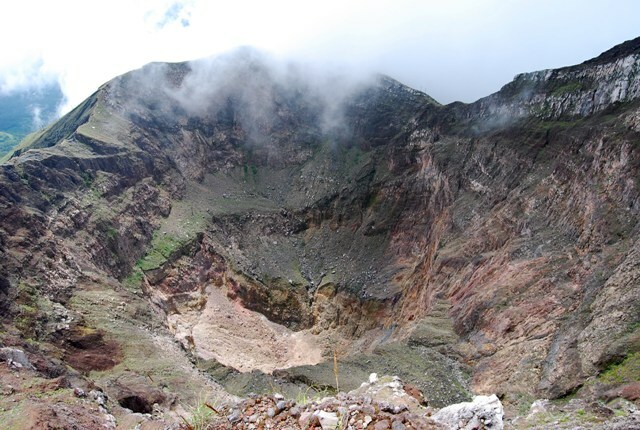 In April 2010 the crater was dry and without smoke and it was possible to go right down to the bottom, though it would involve a certain amount of scrambling, and it would be a tough climb back out – it’s a very deep crater. 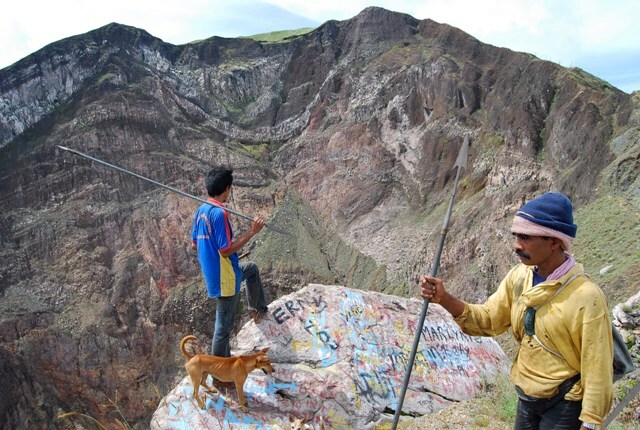 Locals often come up to the peak to hunt the feral goats that live on the slopes, chasing them into the crater and bringing them to bay on the sheer cliffs. A full circuit of the crater rim takes around an hour, more if you linger to enjoy the views – or get involved in a goat hunt! The path from Lamalota hits the rim at one of its lowest point, directly opposite the summit. Turn left here and make the circuit clockwise (you could do it in the opposite direction but there’s a point where a little scrambling is necessary that is certainly easier going up than it would be coming down – this point is decidedly exposed, and may alarm vertigo sufferers and those of a generally nervous disposition, but it’s not real rock climbing!). After that scrambling section the path rises steeply again, clinging close to the crater edge, before the ground levels out towards the summit into a stretch of rolling grassland that would offer fine camping opportunities (though you would need to bring enough water from below). There is no distinct path here, just a few goat trails, but the grass is short and you can wander at will before reaching the actual summit, which would be easy to miss were it not marked with a trig point. 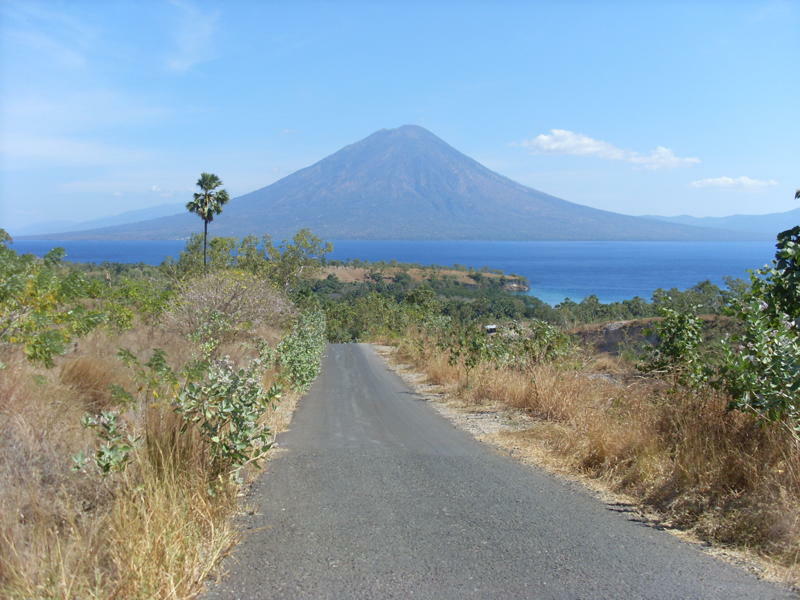 The views down to the coast, to Solor, and to Lembata are brilliant, and if it’s clear you’ll see Ili Boleng’s twin, Ile Api (also called Lewotolo), on Lembata (Ili/Ile means “mountain” in the local language). 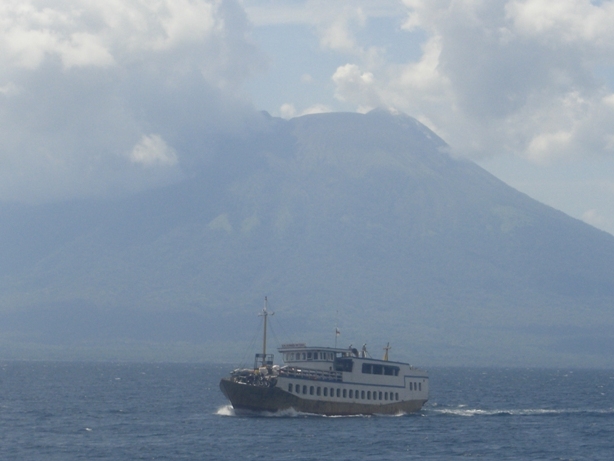 Getting there: The most obvious approach to Adonara is from Larantuka on Flores. 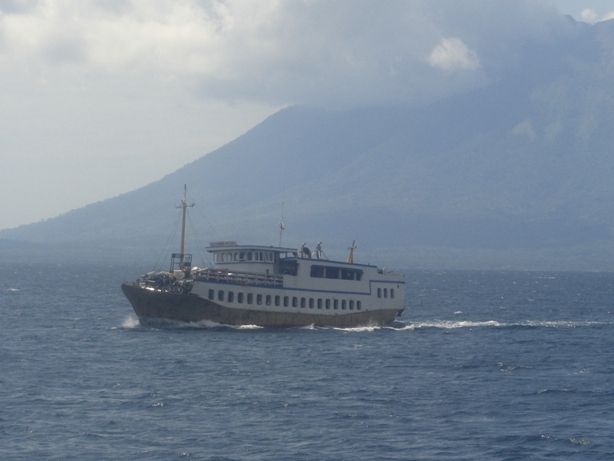 Ferries make the run from there to Waiwerang, Adonara’s capital, several times a day, starting in the morning, The crossing takes about an hour and costs about Rp15,000 per person, and after Adonara the boats run on to Lewoleba on Lembata. Transnusa Airlines fly to Larantuka (and to Lembata) from Kupang. 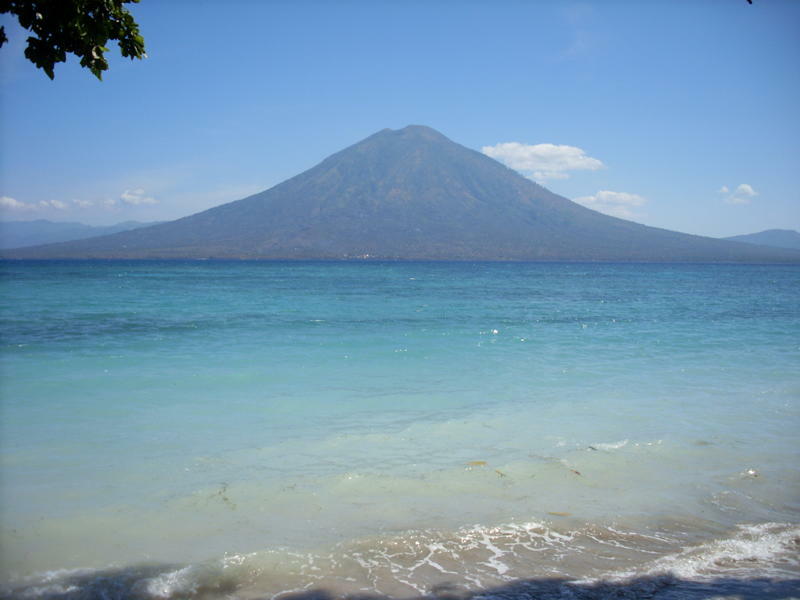 The closest major airport served by big planes is Maumere, about three hours by road from Larantuka. Accommodation: There is some basic accommodation in Waiwerang. The Hotel Ile Boleng, listed in the most recent Lonely Planet guidebook, in fact closed some time ago. Today the best option is Hotel Asri, more a homestay than a hotel with just four simple rooms. Turn right from the ferry landing (passing the second choice, a decidedly grubby losmen, immediately on the right) and go up the road a couple of hundred metres to a crossroads. Turn left; the homestay is on the left. 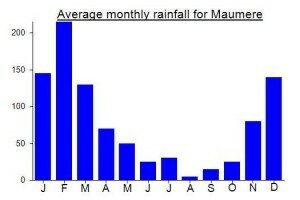 Water sources: None available on the higher slopes – take sufficient supplies with you. 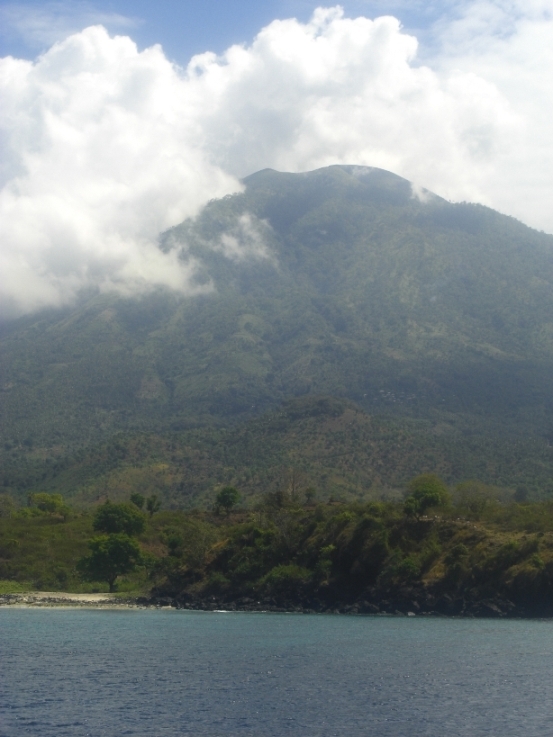 I went up Ili Boleng in late April 2014, solo without a guide. After asking around a lot, I decided to go up from Lamahelan, as I had visited the village before. Lamahelan is a very traditional village, they have sacred objects all around and a visitor should be very careful not to touch them or climb on stones. If the elders allow, one can also see the elephant tusk that they keep (no touching, no photography). However, there are many trails in the lower part and I got a bit lost but soon hit the main trail that goes up the mountain – straight up, it is very steep and very eroded. It also disappears towards the top and some wandering around the bushes was involved. The trail was so steep that I would not want to go down the same way. On the top I saw some (wild?) horses. 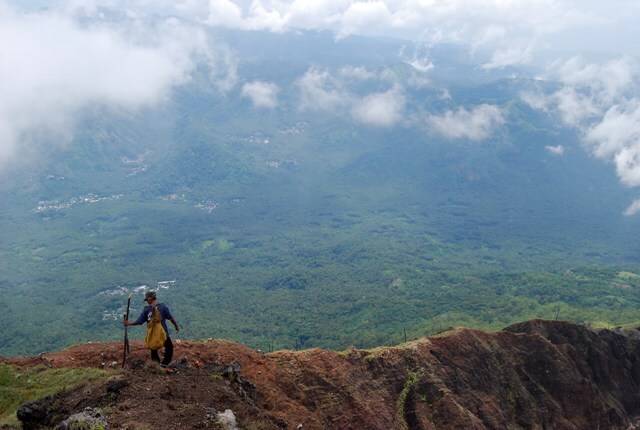 I also met a man (Bapak Wilhelmus) from the village of Lamalota at the top. 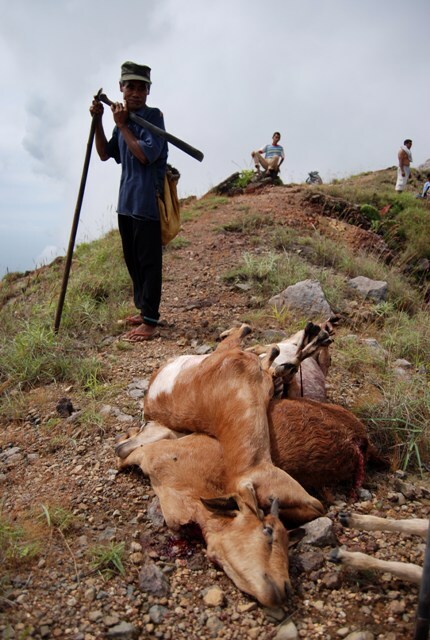 He was also “hunting” some goats but rather than wild goats, these turned out to be his own goats that usually stay on top of the volcano to graze. 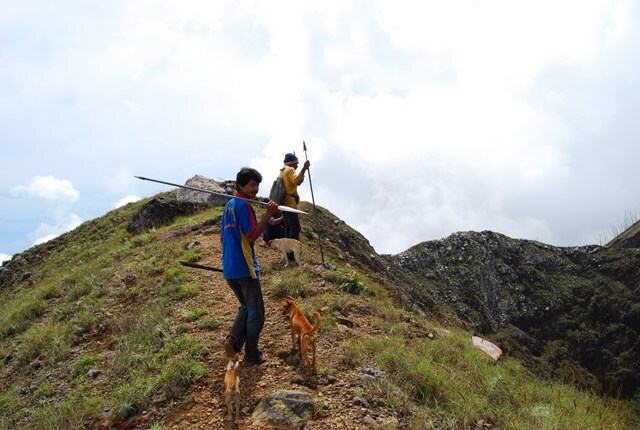 He was taking them a few hundred meters down the mountain in order to give them salt (salt and fish are prohibited at the top!). This is certainly not the most direct route, since we stopped to feed his pigs, get some cassava and drink a bottle of arak with a friend of his who was working in the jungle 🙂 But this trace should do the job for someone who wants to go without a guide. Otherwise, the people of Lamalota were extremely friendly (in fact I cannot say the same about the people in Lamahelan) and a guide should be easy to find. This route is a lot easier than the Lamahelan one. No more than 20000 rp during the day and 30-40000 rp at night is what locals would pay for an ojek from Lamalota to Waiwerang. If you want to stay at the villages around here (Tobi is another option), all you have to do is ask. 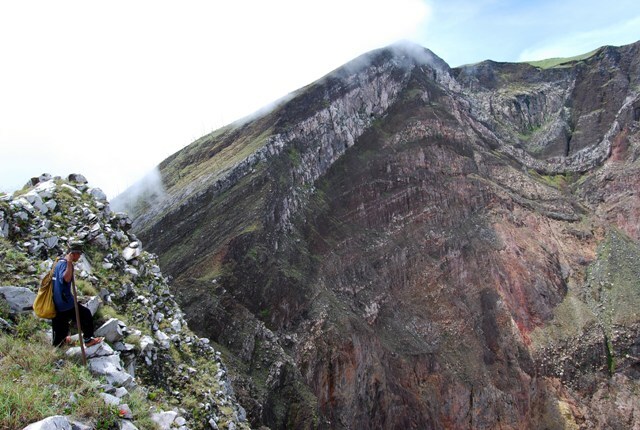 Myself, Rob Woodall and Adrian Rayner climbed this last week as part of a week of bagging in the Flores area. Took a different route to the one Tim describes (there had been a death in that particular village) – started at Watololon (361m)a village lying to the north of the mountain. The vague trail goes through bouldery village plantation before heading straight up to the rim on a steep grassy and rocky ridge (good views to north coast). 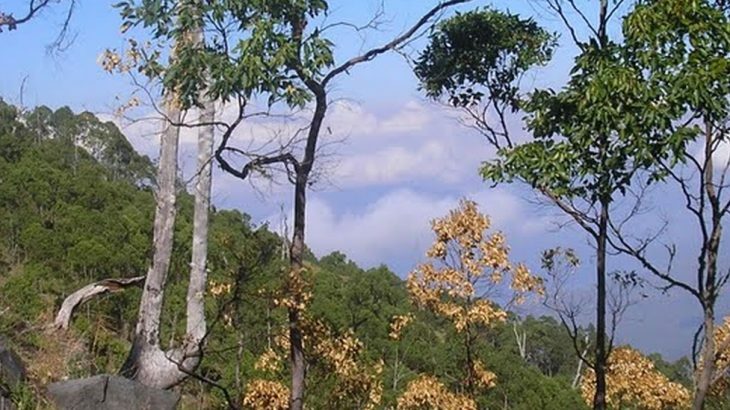 The vegetation is not dense and the fairly sparse trees finish at 1,130m. It took us less than 3 hours to reach the lower part of the rim (1,430m). It is indeed a superb, deep crater which takes just over an hour to do a circuit of. As Tim says there is one section where a head for heights is needed (a bit of exposed scrambling) and a clockwise circuit is definitely the better option – though we did the opposite. 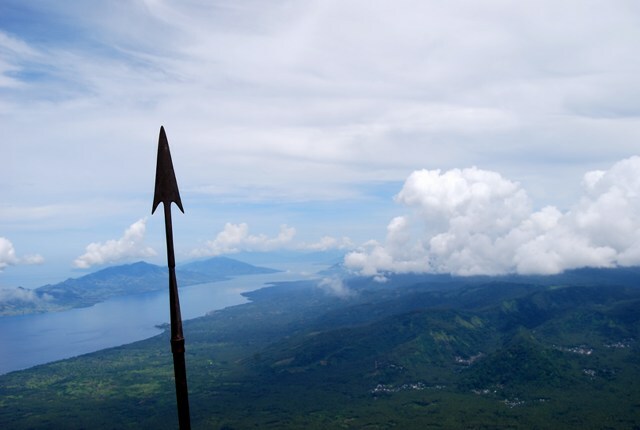 From the summit trig point the views to Ile Ape (Lewotolo) and Ile Labelekang are great. We met our machete and gun-wielding guide’s friend near the top and he gave us some bananas (both boiled and non-boiled) and offered us some weird tasteless cereal-type stuff we had previous tried at Larantuka market. Spotted the wild horses. On the way down our guide climbed a coconut palm (during which a herd of wild goats stole the remains of the bananas) and we enjoyed kelapa muda. There should be no trouble in finding a guide at Watololon. 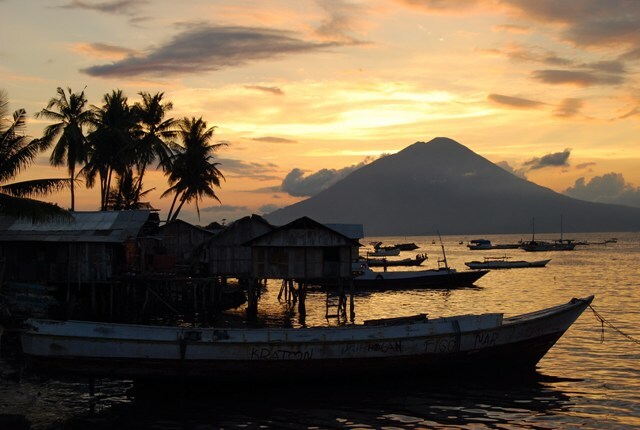 We too stayed at the very very basic Hotel Asri and aroused a great deal of interest from locals (tourists rarely visit Adonara) who stared at us and slowly moved closer and closer to us as we sat on the porch before finally having the guts to speak! Generally friendly but Waiwerang harbour is an unpleasant place – lots of hassle from youngsters selling boiled eggs and similar! Info yg snagat berguna nih.